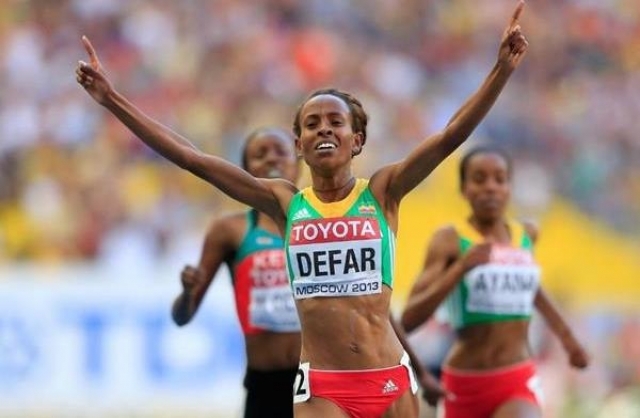 MOSCOW (TADIAS) – After missing out on the 5000m gold at the last two world championships, Ethiopia’s two-time Olympic champion Meseret Defar reclaimed the title in Moscow on Saturday night. “The race today was very tactical, the first kilometer was slow, then the pace started to increase,” said Meseret, who kicked for home with 200m remaining and won in 14:50.19 ahead of Kenya’s Mercy Cherono, while Ethiopia’s Almaz Ayana earned bronze in 14:51.33. Meseret took 5000m bronze at the 2009 and 2011 world championships in which she had contested that event as well as the 10,000m. She and her compatriot Tirunesh Dibaba, who took gold over both distances in 2005, had wanted to make the same double attempt in Moscow, until Ethiopia’s athletic federation intervened. Meseret’s personal best for the distance is 29:59.20. “In the end, based on the federation’s request that we both run one event each to allow upcoming athletes to participate, both of us agreed and gave the opportunity to the youngsters,” she said. The two-time Olympic 10,000m champion Tirunesh won the Moscow world championship race on Sunday, leading her teammate Belaynesh Oljira to bronze. “Giving the younger athletes the opportunity has made me feel good, and Tirunesh got the gold as you saw, and I’m very pleased,” said Meseret, who was keen to uphold national pride along with her less-established teammates in the 5000m. The two star athletes have shared the long distance titles at global championships on prior occasions, with Tirunesh winning the 10,000m and Meseret the 5000m at the 2007 world championships and 2012 Olympics. “After that, after I recovered from my illness, I was back to my best when I performed well and ran a fast time in Oslo,” added Meseret, who in Norway ran the third-fastest 5000 of the year, 14:26.90, winning ahead of Viola Kibiwot of Kenya, who will be in Saturday’s final, and Genzebe. The year’s fastest 5000m runner, Tirunesh, clocked 14:23.68 in July in Paris, where her surprise runner-up was the 2013 Ethiopian steeplechase champion Almaz Ayana in 14:25.84. The Athens 2004 Olympic champion Meseret regained that title in London last year after taking bronze in Beijing in 2008, and she has now succeeded in staging a similar comeback at the world championships, trading up her Berlin 2009 and Daegu 2011 bronzes.